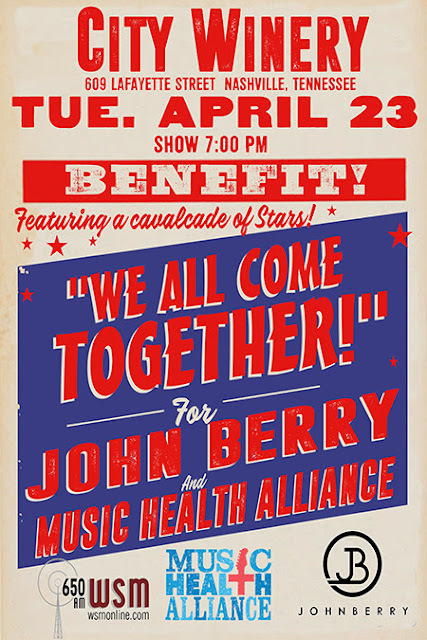 “We All Come Together" for John Berry and Music Health Alliance has announced two additional options to support the benefit concert on April 23rd. Contributions to the benefit can be made by texting the word DONATE to 678-666-5269 and following a URL link in the response. An online auction will go live on Thursday, April 18 at 9 AM CDT with new auction items added through the day of the benefit concert and once live can be viewed at accelevents.com/e/JBMHA. WSM Radio on-air personalities Chris Kulick, Devon O’Day and Mike Terry along with Lorianne Crook and Charlie Chase of the Crook and Chase show will emcee the benefit concert. Artists who have stepped up to perform were revealed by media partner WSM Radio and live-streamed on The Heartland Network on the Cody, Coffee and Country show.